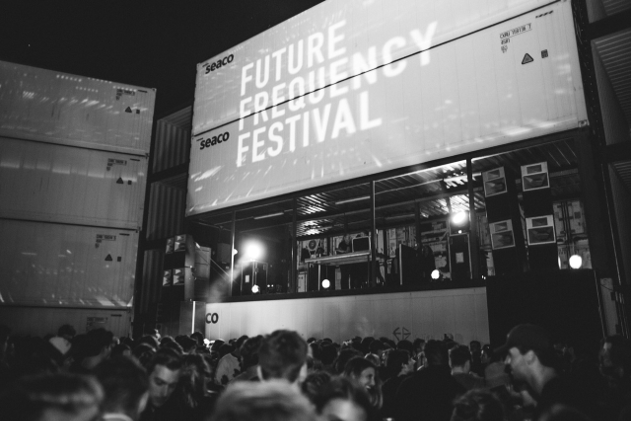 It’s been two days since Future Frequency Festival. I haven’t left their SoundCloud page and I’m still trying to remove the stones wedged into the soles of my platform sneakers. What a rave! I’m talking the true-to-form underground, abandoned-warehouse, don’t-tell-your-parents kind of rave. That good impulsive kinda jol. 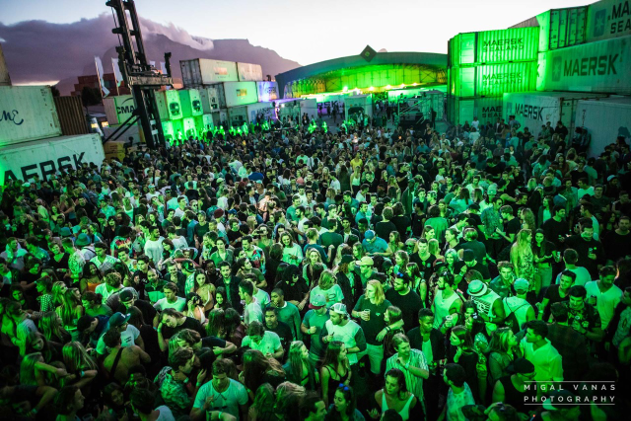 So I hustled a crew and headed off late Saturday afternoon knowing nothing more about the festival than the keywords: containers, techno and Victor Ruiz. A couple of circles around the block later and we were walking through a container yard past a man casually yielding a rottweiler, towards three container “doors” flagged with Future Frequency Fs. We’d arrived. And boy did the castle of containers assure us that we were indeed at an avant-garde music festival in the heart of industria—not a blade of grass in sight. Standard festival protocol means sussing out the bar, food and loos before heading to the dancefloor for a few straight hours of stomping. 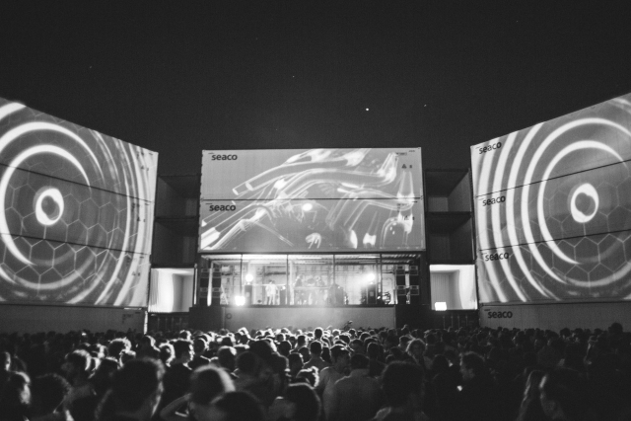 The warehouse opposite the stage housed an array of containers, each with a different purpose and lit up with a different neon colour after dark. Hookah pipes filled one, table-tennis another, one had bean-bags in it and most surprisingly, one of them was a massage parlour. Imagine the absolute contrast of softly scented aromatherapy oils with concrete surrounds and techno sounds—wabi sabi AF. 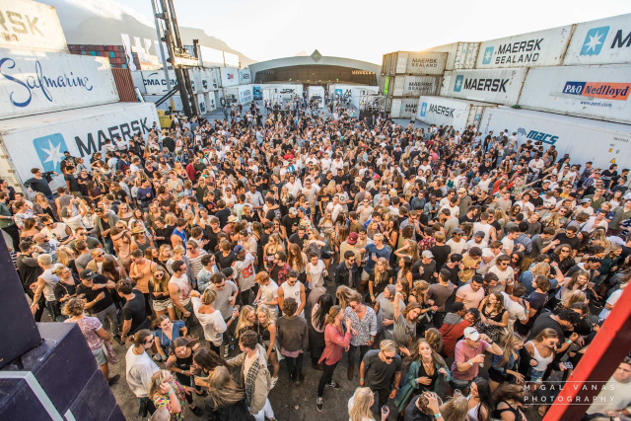 Amidst the container carnival was a Howler-less bar (yes please! ), a cocktail bar and a selection of meatless food stalls. Kudos, guys. I’ll take a carbon-conscious chickpea and R100 back at the end of the night because I didn’t have to load it on an easily lost card. That said, we paid for our drinks with actual money and headed to the dancefloor to join the army of ravers reporting for duty. I dived into the sounds of Oliver Koletski and Niko Schwind on the Funktion-One system as they played a transitional set that carried the crowd from day to night, in a blur of bangers and bass. Then it was back to the bar for another round before settling in for the long haul. Brother lead us into nightfall with a mix of heavy drops and smooth shifts. The night promised (and delivered) a sensory spectacle as projectors began beaming a vignette of vivid visuals onto the canvas of containers. Next up, B_Type threw down a multitude of crisp, melodic bass-lines. Shall Ocin, the penultimate performance and my personal favourite of the night, took us places with an immaculately balanced set of harmonious beats and hard-techno. Last up, Victor Ruiz. Does this cat play anything but intros (asking for a friend)? On a serious note though, Ocin definitely gets my vote for the most underrated set of the night. A quick venue switch took the hardened-techno lovers to Era for Ms CJ’s set to close the festival. 40,000 plus steps later and a BPM-induced afterglow; I headed home ready to book a flight to Berlin, bag a Berghain entry and commit to a lifetime of eat, sleep, dance, techno, repeat.